And I found these. They are spectacularly easy, have a wonderful caramely flavor, and are nice and gooey. They most definitely did not disappoint. I doubled the recipe and baked it in a 13″ x 9″ pan with no problem, and used chocolate chips instead of nuts. I think this may be one of my new favorite recipes. Pre-heat oven to 350 degrees F (175 degrees C). Lightly grease a 9 x 9 x 1-3/4 inch pan. Stir in the flour mixture and the nuts until well blended. Spread evenly in prepared pan. Wow, those sound a lot like the Blondie recipe I make all the time and LOVE!! Yum! I’ve only made blondies once but I too love them. It’s good to have recipes like this that are easy to make and so tasty. 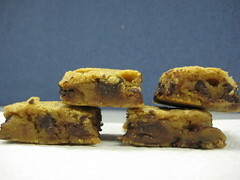 I make something very similar called Congo Bars (I found it in David Lebovitz’s Book of Chocolate). They taste even better after sitting for a day or two, but they are hard to resist for that long. They are very easy to whip up when I need a dessert but don’t want the hassle. I haven’t baked in a while but these look really good. I think I will try them! I’m glad you mentioned the chocolate chips. I hate walnuts. We eat congo bars at our favorite vacation spot. I think I will make these tomorrow. I am making no-egg Key lime pie for my sister’s birthday and these might be a nice addition. I just found your website yesterday, and LOVE it. Too cool! I was looking specifically for a recipie for my excess brown sugar sittin’ on my shelf, and I used this recipie. Too easy to make. ‘Cept I used whole wheat flour and M&M’s in my mix cuz that’s what i hade sitting here. YUM! These look great -and the fact that their easy makes it likely I’ll try them in the near future. Made these on Thursday afternoon, put in dark chocolate and white chocolate chips. My hubbie took them to work the next day and came back with two left! He now keeps telling me to make them again! Great recipe.